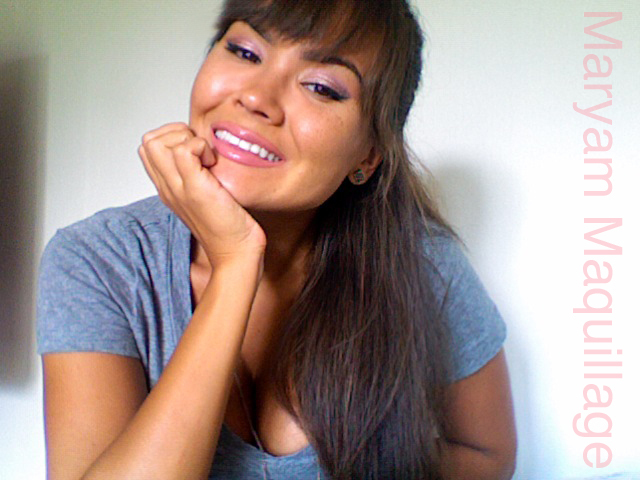 My favorite type of makeup for every day is simple, clean, happy and fresh. 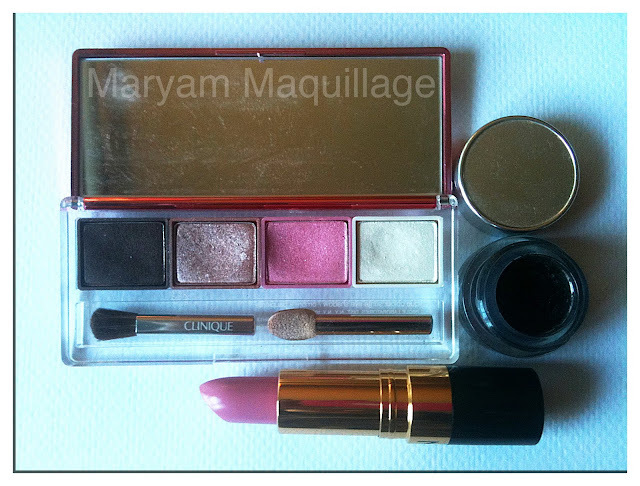 I love pairing muted pinks with soft browns and nudes as well as giving the overall look a shimmery youthful glow and a barely there lippie. This type of makeup can be achieved easily using any of Clinique's eyeshadow quads. The shadows are expertly designed to be very wearable and universally flattering. I've had this quad for quite some time, so I'm assuming this eyeshadow combo has since been discontinued, however, if you like any of these colors, they're all available individually. Here are the swatches and the names of the shadows (in the same order as they appear in the quad). 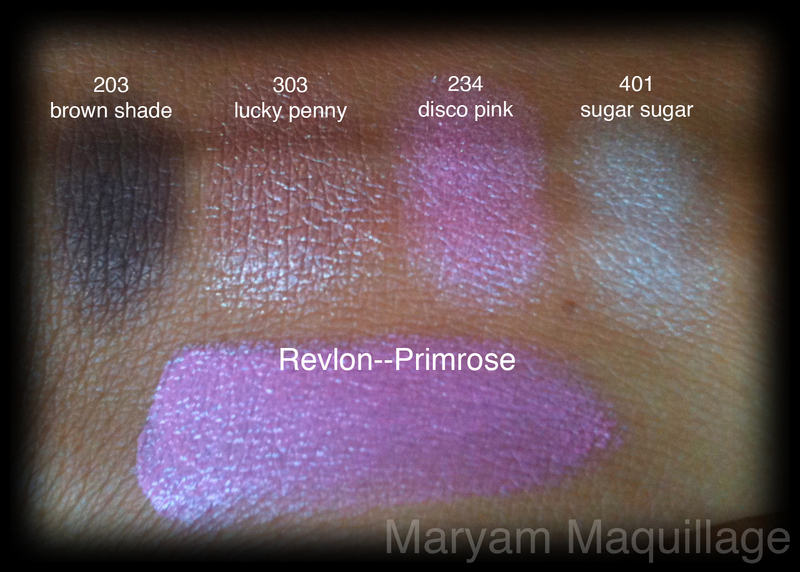 My favorite eyeshadow out of the four is lucky penny because it's very pigmented and has a super shimmer finish. 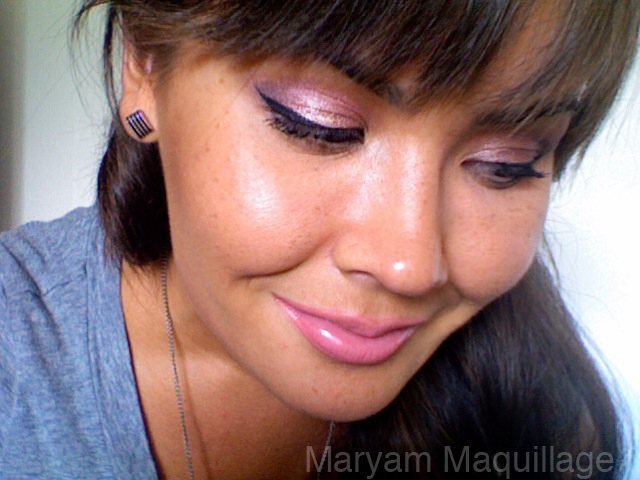 In the look I'm wearing, I used lucky penny on my lid, brown shade in the outer "v" and disco pink in the crease. Sugar sugar is the least pigmented and works better as a highlighter on the cheekbones rather than an eyeshadow, and I used it precisely as such :) Now, on to my lip color and some very important lip tips! Revlon super lustrous lipstick in Primrose is a stunning lip color, though I don't see it as universally flattering. Primrose is a creme finish pale mauve lipstick and would look best on light skin with olive or yellow undertones. I topped the lipstick with clear gloss in order to make it work for me, otherwise it was way too pale for a bright sunny day and made me look like I had no mouth at all. As you can see in the swatch above, the color is lighter than my skin, which can be a bit tricky to wear. Be careful when choosing pale lip shades, they can work both ways--some can make you look fresh and youthful while others can make you appear sickly and malnourished. Keep in mind the lighting: the same lipstick will look look darker, lighter, pinker and/or more/less flattering depending on the time of day and weather conditions i. e. overcast, rain, sun, etc. Here's an example of Primrose on a gloomy, rainy day and personally, I find it more flattering. i love that lipcolor on you. And for some reason, I really love the name of the lipstick Primrose! I think its because it reminds me of one of my favorite books. Anyway, lovely look as usual! I LOVE that palette!!! You look so pretty in this look! very pretty, and i love your earrings! How pretty. I can't possibly ever learn to do my make up this well, womp womp. Good lord lady, is there any color you can't wear? I don't have many lippy tricks other than using different shades on the outer corners than in the middle but that's not exactly reinventing the wheel. Good luck with all your tasks, I'm swamped with stuff too at the moment. Makeup life. School life. Love life. All going full steam ahead and all going in different directions. It's a miracle I can even sleep at night. Gorgeous. I love the swatches too. They look amazing. You look stunning. I love the makeup. I don't think I own any makeup from Clinique. I guess I always think of them as more of a skincare line. 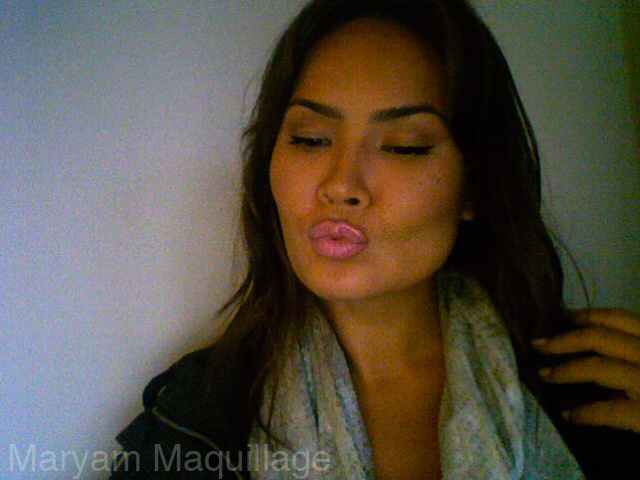 I have a hard time wearing bubblegum pinks or really brown nudes...they just don't go with my skintone. If I do wear them, I usually add a nice flattering lipgloss on top. You look beautiful! Jesus girl your cheek bones can cut me from here. I always love your make up posts. I am quite a beginner so reading your posts always helps me when picking colors & what works. Love this simple & clean look - perfect for the office. Love this look. The lipstick is gorgeous on you! I actually have the same one, and I'm going to try it with lipgloss because the result is stunning! Thanks for sharing love. very pretty doll....love lucky penny in that set. Your makeup looks absolutely flawless. Very nice look! I'm also a fan of pink and taupes/browns on the lid! you look amazing-- i love that palette! Gorgeous! You look beautiful. I've been a long-time fan of Clinique especially their skincare. hey girl the look came out great! love pinks and your freckles ! I absolutely love what you've done with that quad! Too bad it's not available anymore.